Something amazing happened to me this past summer. For the first time since I stumbled into a certain English girl in Paris almost two years ago, I met someone who swept me up in an intoxicating, dizzying spiral of love. It was easy to fall for her. Her eyes were a shimmering blue that, like the sea, I could not look away from. She was a voracious reader, and she wrote poetry when the mood struck. 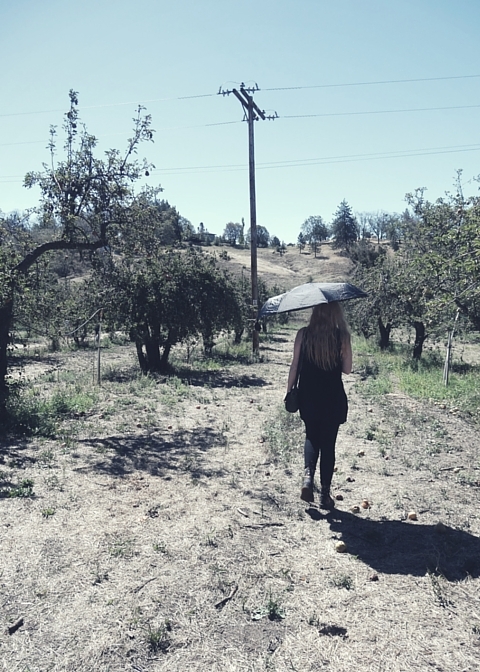 She was adventurous–not long after I met her, she drove north from San Diego to Big Sur, and camped out alone in the woods. She was a willowy, melancholic human being, and she brought a whirlwind of emotion with her into my life. I had gone at least a year without feeling even the slightest emotion for another woman, and the sensation of plunging suddenly into her depths caught me off guard. I was hooked. But I was hooked–she wasn’t. Or she was, but not enough. She had an ex-boyfriend who was lurking in the recesses of her heart, and this–along with other factors that I still don’t completely understand–kept her apart from me. Ten days before I left San Diego and returned to Europe, she told me that she didn’t want to–couldn’t, in fact– see me anymore, at least romantically. Initially I was devastated by what felt like unrequited love. As I get older and know different people, a genuine connection is easier to identify and understand. And this was my first encounter of such kind in close to two years. It felt like the potential for something glorious cut much too short. I can see how even though I matured so much and became more comfortable with myself on my first long bout of traveling, that long stretch of time without someone else to love and be loved by looks a little bit barren in hindsight. I had experienced so much but shared so little–and then for two months this past summer I knew what it was again to share everything I could. We met for a few hours on my last day in San Diego before I returned to Europe. On my first week here in Florence, I messaged her a few times. And now it’s been ten days since we spoke. I have to give a lot of credit to this article by Mark Manson for having the willpower to not talk to her. He makes a good point, doesn’t he? Unrequited love is painful, but it’s not worth the thousand bitter cuts that come from lamenting and yearning ad nauseum. At previous times in my life, the process of getting over an ex (or in this case, girl who I had a summer fling with but really, really liked) dragged on and took months. I sank into depression. My self-esteem, including my virility, felt sapped. I rarely went out and met new people or went on dates. But that hasn’t happened this time. I still feel a sense of loss; I haven’t completely abandoned hope that she will reach out to me. That isn’t why things are different, though. 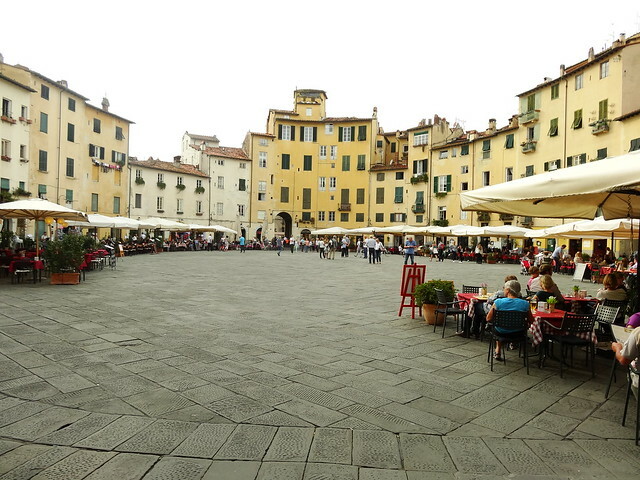 My life is more full than it has ever been, and I give a lot of credit to my profession and beautiful places like Lucca, a walled medieval town in the Tuscan countryside I visited a couple weeks ago. You can in fact run away from your problems! However, my enchantingly lovely home base of Florence, nor my thus-far rewarding career as a freelance writer are the true reasons for my positive frame of mind. “No man is an island,” proclaimed John Donne, and it’s taken me many years to understand, but it’s true in practice. More than any other time in my life, I am surrounded by people who care about me, who think I’m awesome, and who make the time to be with me just as I do for them. My friends Charlie and Virginie, who I met almost seven months ago in Normandy, just came to visit me here in Florence for a few days. I Skyped with Mallory recently, and my best friend Deena (who made a cameo appearance in this blog over a year ago) talked to me right before I left. I’ve also been lucky enough to meet a really wonderful girl from Tennessee who is studying here for the semester, but that’s a story for another time–and it won’t be an unrequited love story, thankfully. 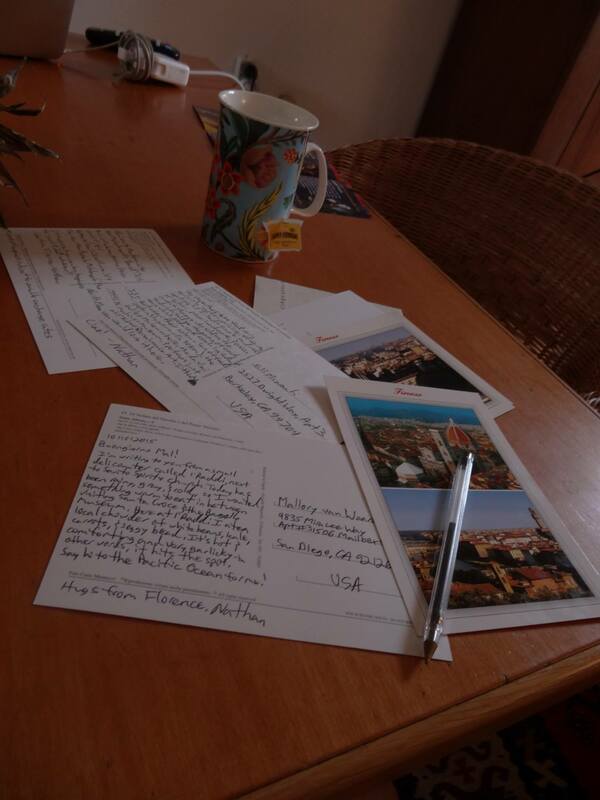 Plus there are the thirteen separate postcards I sent when I arrived here in Florence. If nothing else could do it, writing out notes to friends, plus a few of my closest family members made me realize how I am not at all alone. I’ll admit that one of those postcards went to that unrequited love of mine. By now it’s probably been a week since she got it. I wonder if it sits next to her bedside, or if it’s tucked into one of the books I left with her. Or maybe she threw it away? These are idle thoughts to ponder–2 AM thoughts (it’s 2:09 as I write this). But they are constrained to the night, when our fears and our deepest loathings and insecurities run wildest. The difference between who I was two years ago and who I am now is that those fears preoccupy me less. For that I have two years of getting to know and love myself, but I also have friends to thank. That’s how you make the most of unrequited love–instead of letting it take you to the bottom, you reach for those closest to you, and you let them pull you back up. And you realize how lucky you are to have people in your life who care enough about you to keep you from falling. Posted in UncategorizedTagged getting over someone, make the most of unrequited love, mark manson, moving on from someone, unrequited loveBookmark the permalink. Nice words about relying on others to pull you back from this kind of situation. Got me thinking… Great blog you have here, stumbled across it by accident. Really got me in the mood for living on the road again, guess i miss it more than i thought. Look forward to reading more! Thank you Camila, glad this resonated with you. Have you also had friends pull you back before when you suffered from loss/heartbreak?